Java SE 6 introduced the Service Loader, a simple service-provider loading facility, that attempted to unify the different ad-hoc mechanisms used by Java's many factories and builders. The design allows a JAR to advertise the name of one or more embedded classes that implement a given interface and consumers to obtain instances of these implementation classes through the Service Loader API. Though the Service Loader is about extensibility, its own design is closed and therefore not extendable. It does not support a provider model that would allow different ways of finding interface implementations; its classes are final and its policy is fixed. Unfortunately, the Service Loader's fixed design uses a non-modular class loading policy; it defines its visibility scope with a class loader, which in general requires full visibility of the application's class path. The Service Loader can therefore in OSGi not find implementations from other bundles. Additionally, the Service Loader also does not enforce a life cycle; objects are handed out forever. Since the Service Loader is the only standardized plugin mechanism in the JRE it is necessary that the mechanism is supported in OSGi with as few changes as possible from the consumer's authors. This specification therefore defines a mediator that ensures that the Service Loader is useful in an OSGi Framework, allowing programs that leverage the Service Loader to be used in OSGi frameworks almost as-is. Compatibility - Allow JARs that run in a classic Java SE environment that leverage the Service Loader to run in OSGi with only manifest modifications. Services - Register services for Service Provider bundles that opt-in. Security - Enforce service permissions for the Service Loader objects. Life Cycle - Manage the life cycle mismatch between OSGi bundles and the Service Loader's create only model. Service Loader - An API in Java SE that allows a Consumer to find an implementation of a Service Type from a Service Provider by searching a class loader for Service Providers. Service Type - The interface or class that the Service Provider must implement/extend. Provider Configuration File - A resource in the META-INF/services directory that has the fully qualified name of the Service Type and contains one ore more fully qualified names of Service Providers. Service Provider - An implementation class that implements or extends the Service Type. Consumer - A class that uses the Java SE Service Loader inside an OSGi framework. Mediator - An extender that mediates between Consumer bundles, the Service Loader API, and Service Provider bundles in an OSGi environment. It consists of a Processor and a Registrar. Processor - Modifies a bundle that uses the Service Loader API so that it works in an OSGi environment. Registrar - Registers services on behalf of a bundle that contains Service Providers. Register OSGi services for each Service Provider. Allow Consumers that uses the Service Loader API to access Service Providers from other bundles that would normally not be visible from a bundle. A Service Provider bundle can provide access to all its Service Providers through OSGi services by declaring a requirement on the osgi.serviceloader.registrar extender. This requirement activates a Mediator to inspect the osgi.serviceloader capabilities. If no register directive is used then all Service Providers for the given Service Type must be registered. Otherwise, each capability can select one Service Provider with the register directive. The fully qualified name selects a specific Service Provider, allowing different Service Providers to be registered with different service properties. 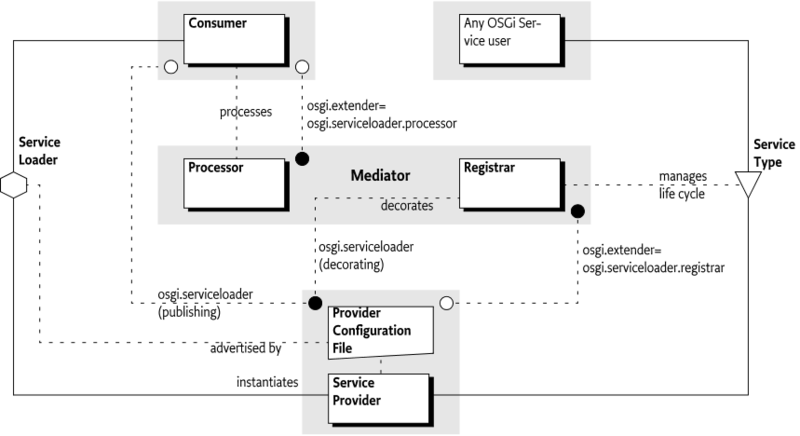 The Mediator will then register an OSGi service factory for each selected capability. The osgi.serviceloader capability's attributes are used to decorate the OSGi service registration with service properties. The service factory returns a new instance for each service get. Consumers are classes that use the Service Loader API to find Service Provider instances. Since the Service Loader API requires full visibility the Service API fails to work inside an OSGi bundle. A osgi.serviceloader.processor extender, which is the Mediator, processes bundles that require this capability by modifying calls to the Service Loader API to ensures that the Service Loader has visibility to published Service Providers. A Consumer's bundle by default receives visibility to all published Service Providers. Service Providers are published when a bundle declares one or more osgi.serviceloader capabilities for a Service Type. If the Consumer has an osgi.serviceloader requirement for the given Service Type then the Mediator must only expose the bundles that are wired to those requirements and for each bundle provide all its Service Providers. Java is quite unique with its focus on separation of specification and implementation. Virtually all Java Specification Requests (JSR) provide a specification that can be implemented independently by different parties. Though this is one of the industry's best practices it raises a new problem: how to find the implementation available in a Java environment from only the Service Type. A Service Type is usually an interface but a base class can also be used. Finding a Service Provider (the implementation class) from a Service Type is the so called instance coupling problem. The use of Service Types removed the type coupling between the Consumer of the contract and the Service Provider of the contract (the implementation) but to make things work there is a need of at least one place where the Service Provider is instantiated. The very large number of factories in Java reflects that this is a very common problem. The general pattern for factories to find Service Providers was to search the class loaders for classes with constant names, varying the package names, often using System properties to extend the different areas to be sought. Though a general pattern based on class loading tricks emerged in the Java VM and application programs, all these patterns differed in details and places where they looked. This became harder and harder to maintain and often caused unexpected instances to be found. The java.util.ServiceLoader class was therefore first introduced in Java SE 6 to provide a generic solution to this problem, see  Java Service Loader API. With this API Service Providers of a specification can now advertise their availability by creating a Provider Configuration File in their JAR in the META-INF/services directory. The name of this resource is the fully qualified name of the Service Type, the Service Provider provides when instantiated. The Service Loader API finds all advertisers by constructing the name of the Provider Configuration File from the Service Type and then calling the getResources method on the provided class loader. This returns an enumeration of URLs to the advertisements. It then parses the contents of the resources; that will provide it with a list of Service Providers for the sought Service Type without duplicates. The API will return an iterator that will instantiate an object for the next available Service Provider. The class loader restricts the visibility of the Service Loader to only the resources to which the class loader has visibility. If the Service Loader has no access to the advertisement of a Service Provider then it cannot detect it and it will thus not be found. The Service Provider is loaded from the given class loader, however, the Class.forName method is used, which stores it in the cache of the initiating class loader. This means that Service Providers are not garbage collected as long as there is a resolved bundle that used the Service Loader to get that Service Provider. In the Service Loader API, the class does not have to originate from the same JAR file as the advertisement. In OSGi this is more restricted, the advertisement must come from the same bundle or must be explicitly imported. Though the Service Loader API is about extensibility and contract based programming it is in itself not extendable nor replaceable. The ServiceLoader class is final, it comes from a sealed JAR, and is in a java package. It also does not provide an API to provide alternate means to find implementations for a Service Type. Consumers are classes that are not OSGi aware and directly use the Service Loader API. The Service Loader has a non-modular design and Consumers therefore run into many issues when running in an OSGi framework. Consumers should therefore in general be converted to use the OSGi service layer since this solves the visibility issues, life cycle impedance mismatch, and other problems. The Consumer part of this specification is therefore a last resort to use when existing code uses the Service Loader API and cannot be modified to leverage the OSGi service layer. The Service Loader Mediator can process the Consumer by modifying calls to the Service Loader API. This specification does not detail how the Mediator ensures that the Consumer has visibility to other Service Providers. However, a Mediator could for example set an appropriate Thread Context Class Loader during the call to the Service Loader's constructor by weaving the Consumer's byte codes. Processing is an opt-in process, the Consumer bundle must declare that it is willing to be processed. The opt-in is handled by a requirement to the osgi.serviceloader.processor extender. This requirement must have a single cardinality (the default) since the Mediator uses the wiring to select the Consumer to process when multiple Mediators are present. If the extender osgi.serviceloader.processor requirement is satisfied then the wired Mediator must process the Consumer. The Mediator must give visibility to all bundles with published Service Providers unless the Consumer restricts the visibility by having osgi.serviceloader requirements. Bundles publish a Service Type, meaning all their Service Providers for that type, by having at least one osgi.serviceloader capability for that Service Type. A Consumer's bundle can restrict its visibility to certain bundles by declaring an osgi.serviceloader requirement for each Service Type it wants to use. Only bundles wired from those requirement provide their advertised Service Providers. If no such requirements are declared then all bundles with the published Service Type become available. The cardinality can be used to select a single Service Provider's bundle or multiple bundles if it needs to see all Service Provider bundles. The requirement can be made optional if the Consumer's bundle can work also when no Service Provider bundle is available. See osgi.serviceloader Namespace for more details. In this example, any bundle that publishes the org.example.Foo Service Type will contribute its Service Providers. With Service Registrations, see Registering Services, the capability can discriminate between multiple Service Providers in the same bundle. The Service Loader API does not have this feature: any wired requirement has visibility to all Service Providers in the wired bundle, regardless of the registered directive. A Consumer can only see Service Provider instances of bundles that are active during the time the next instance is created. That is, the Mediator must treat the life cycle of the Service Provider as if it was a service. However, the Service Loader implementations perform extensive class loader techniques and cache results. The exact life cycle of the Service Provider bundle with respect to the Consumer is therefore impossible to enforce. The Service Loader API does not have a life cycle, objects are assumed to stay alive during the duration of the VM's process and due to the use of Class.forName in the Service Loader implementations. Therefore a Mediator should refresh a Consumer bundle when it is using a Service Provider and that Service Provider's bundle becomes stopped otherwise long running applications can run out of memory when bundles are regularly updated. A legacy JAR for which there is no more source code uses the Service Loader API to get access to com.example.Codec instances through the Service Loader API. With this manifest, the Consumer bundle has full visibility to all Service Provider bundles that are published. The following lines can be added to restrict the visibility to codecs that have support for WAVE formats (although all Service Providers in that bundle will be visible to the consumer). A Service Provider bundle is a bundle that contains one or more Service Providers that are usable by the Service Loader API. This section shows how Service Provider bundles should be constructed and what options they have. Service Providers are implementation classes that are advertised under a Service Type according to the rules in the Service Loader API. A Service Provider is advertised with a Provider Configuration File in a JAR. In an OSGi environment the Service Provider must reside in the same bundle as the advertisement or be imported. A single Provider Configuration File can contain multiple Service Providers. See Java Service Loader API. It can be registered as a service. A Service Type must be published to allow its use it in these scenarios. Publishing a Service Type consists of providing one or more osgi.serviceloader capabilities for an advertised Service Type, see osgi.serviceloader Namespace. These osgi.serviceloader capabilities must specify a fully qualified class name of the Service Type, there is no wildcarding allowed. Therefore, publishing a service implicitly makes all corresponding Service Providers available to Consumers. If a bundle does not provide osgi.serviceloader capabilities then it does not publish any Service Providers and its Service Providers can therefore not be used by Consumers. They can then also not be registered as OSGi services, see OSGi Services. Tools can use the advertisement of the Service Provider in the JAR to automatically generate the osgi.serviceloader capabilities in the manifest. A Service Provider bundle must not require the osgi.serviceloader.processor extender unless it needs to be processed; publishing a Service Type is sufficient to allow Consumers to use the published Service Types. The register directive matches the fully qualified name of the Service Provider. A register directive selects a Service Provider if it contains the fully qualified name of the Service Provider, that is, the implementation class. Selection only works for services, Consumer will always see all Service Providers regardless of the register directive due to limitations in the Service Loader API. Selected Service Providers must be registered as defined in Registering Services, with the capability's attributes as decorating service properties. Private service properties (attributes that start with a full stop ('.' \u002E) and the defined capability attributes in the osgi.serviceloader namespace are not registered as service properties. The following example would register the format service property but not the .hint service property for the com.acme.impl.WaveFoo Service Provider. The Mediator must only register OSGi services for selected Service Providers; the Service Provider bundle can therefore decide not to register certain Service Providers and register them with another mechanism, for example Declarative Services or in a bundle activator. Since the Mediator must use the bundle context of the Service Provider to register the OSGi service the Service Provider bundle must have the proper Service Permission REGISTER for the Service Type. To ensure that the bundle opts in to registering its services it must require the osgi.serviceloader.registrar extender. This example implicitly publishes the Service Type com.example.Codec multiple times with different attributes. Consumers that match any of these capabilities will however have visibility to all Service Providers since the Service Loader API cannot discriminate between different Service Providers from the same bundle. It registers selected Service Providers as OSGi services. It processes any Consumers so that Service Loader API calls have proper visibility to published Service Provider bundles. The register directive contains the fully qualified name of the Service Provider. An osgi.serviceloader capability that selects a Service Provider is said to decorate that Service Provider. A capability can decorate multiple Service Providers of the same Service Type and the same Service Provider can be decorated by different capabilities. Figure 133.2 depicts the resulting relations and their cardinalities since the relations are non-trivial. The OSGi service for each selected Service Provider must be registered under the advertised Service Type of the Service Provider, which must match the Service Type specified in the capability. The Mediator must register an OSGi service factory with the bundle context of the Service Provider's bundle. The OSGi service factory must be implemented such that it creates a new instance for each bundle that gets the service. This behavior is similar, though not quite identical, to the ServiceLoader.load() method that gives each consumer a separate instance of the service. The difference is that different users inside a bundle will share the same instance. Private - Private properties, property names that start with a full stop ('.' \u002E) must not be registered. serviceloader.mediator - (Long) The bundle id of the mediator. The Mediator should not verify class space consistency since the OSGi framework already enforces this as long as the publishing capability specifies the uses directive. Any services registered in the OSGi Service Registry must be unregistered when the Service Provider's bundle is stopped or the Mediator is stopped. The Service Loader API causes issues in a modular environment because it requires a class loader that has wide visibility. In a modular environment like OSGi the Consumer, the Service Type, and the Service Provider can, and should, all reside in different modules because they represent different concerns. Best practice requires that only the Service Type is shared between these actors. However, for the Service Loader to work as it was designed the Consumer must provide a class loader that has visibility of the Service Provider. The Service Provider is an implementation class, exporting such classes is the anathema of modularity. However, since the standard JRE provides application wide visibility this was never a major concern. The use of the Thread Context Class Loader (TCCL) is not defined in an OSGi environment. It should be set by the caller and this cannot be enforced. The multi threaded nature of OSGi makes it hard to predict what thread a Consumer will use, making it impossible to set an appropriate TCCL outside the Consumer. A bundle cannot import META-INF/services since the name is not a package name. Even if it could, the OSGi framework can only bind a single exporter to an importer for a given package. The Service Loader API requires access to all these pseudo-packages via the Class Loader's getResources method, the technique used to find Service Providers. Instantiating a Service Provider requires access to internal implementation classes, by exporting these classes, an implementing bundle would break its encapsulation. If a Service Provider was exported then importing this class in a Consumer bundle would couple it to a specific implementation package; this also violates the principle of loose coupling. The Service Loader API does assume an eternal life cycle, there is no way to signal that a Service Provider is no longer available. This is at odds with the dynamic bundle life cycle. Consumers are not written for OSGi and require help to successfully use the Service Loader API. It is the Mediator's responsibility to ensure that bundles that are wired to published Service Types have access to these Service Provider's instances through the Service Loader API. This specification does not define how this is done. There are a number of possibilities and it is up to the Mediator to provide the guarantee to the Consumer that it has been properly processed. A Mediator must only process Consumer's bundles that are wired to the osgi.extender capability for the osgi.serviceloader.processor extender. Since Consumers must require this extender capability with the default cardinality of 1 there can at most be one extender wired to a Consumer. Either the Consumer has no osgi.serviceloader requirements or one of its requirements is wired to one of the osgi.serviceloader capabilities. The Mediator must verify that the Consumer has Service Permission GET for the given Service Type since the Consumer uses the Service Type as a service. This specification therefore reuses the Service Permission for this purpose. The check must be done with the ServicePermission(String,String) constructor using the bundle's Access Control Context or the bundle's hasPermission method. There is a life cycle mismatch between the Service Loader API and the dynamic OSGi world. A Service Loader provides a Consumer with an object that could come from a bundle that is later stopped and/or refreshed. Such an object becomes stale. Mediators should attempt to refresh bundles that have access to these stale objects. Allows the Consumer's bundle to require the presence of a Service Provider for the required Service Type. Provides the service properties for the service registration. Indicates which Service Providers should be registered as an OSGi service. The namespace is defined in the following table and ServiceLoaderNamespace, see Common Namespaces Specification for the legend of this table. The Service Type's fully qualified name. Additional matching attributes are permitted. These attributes will be registered as custom service properties unless they are private (start with a full stop). Use this capability to register a different Service Factory under the Service Type for each selected Service Provider. A Service Provider is selected if the Service Type is the advertising Service Type and the Service Provider's fully qualified name matches the given name. If no register directive is present all advertised Service Providers must be registered. To register no Service Providers, because the capability must only be used to publish, provide an empty string. This section specifies the extender names for Mediators. They are used by both by Consumer and Service Provider bundles to ensure that a Mediator is present. Both names are defined for the general osgi.extender namespace in osgi.extender Namespace in OSGi Core Release 7. Depending on the way the Consumers are processed additional requirements may be necessary. The Mediator connects two parties; it must ensure that neither party will receive additional permissions. The Mediator must ensure that the Consumer has the ServicePermission before it provides the instance. It must use the Bundle Context hasPermission method or the bundle's Access Control Context to verify this. The Mediator must ensure that the Service Provider has the ServicePermission before it provides the instance. It must use the Bundle Context hasPermission method or the bundle's Access Control Context to verify this. ServiceLoaderNamespace - Service Loader Capability and Requirement Namespace. 133.9.2.1 public static final String CAPABILITY_REGISTER_DIRECTIVE = "register"
133.9.2.2 public static final String SERVICELOADER_NAMESPACE = "osgi.serviceloader"